Banks, in providing - or not providing - loans for start-ups, or for small firms to expand, can potentially play an important role in aggregate productivity growth. In the UK, Small and Medium Sized Enterprises (SMEs) make up about half the private sector economy in terms of turnover and employment. UK SMEs remain dependent on banks for the large majority of their external funding. So banks decisions on whom to fund, and who to no longer fund, could make a big difference. The concern that I have discussed before is that a reduction in UK bank lending to SMEs, as banks try to rebuild their balance sheets, would hurt the ability of the more productive SMEs to expand. This in turn would impact on economy wide productivity. There is a longstanding concern that banks that have balance sheet problems of their own will keep ‘zombie firms’ alive to avoid writing off loans, and that this will restrict their ability to lend to new more dynamic firms. UK liquidations have been unusually low in this recession. The Funding for Lending Scheme (FLS) attempted to encourage greater aggregate lending by banks, although it did not initially discriminate between lending to SMEs and household mortgages. Subsequently the government’s Help to Buy programme threatened to divert more of the scarce resource - bank lending - from SMEs. (The possibility that lending to households could ‘crowd out’ lending to firms is examined in this study.) So it is to the Bank of England’s credit that they recently decided to focus FLS on SMEs, and the Chancellor - perhaps grudgingly - agreed. However there may be another process behind the UK's productivity puzzle that has to do with banks, but not the volume of bank lending. About a third of bank lending to SMEs is accounted for by one bank: the Royal Bank of Scotland. (At the time of the financial crisis its market share was 40%: see the Independent Lending Review commissioned by RBS, page 25.) It has become increasingly clear that the RBS has been a seriously mismanaged bank. At the end of 2011 the Financial Services Authority issued a report which was extremely critical of the quality of management at RBS. Part of that poor management included a huge expansion in property based loans before the financial crisis. When those loans went bad, it was many of their SME customers who took the hit, according to a report just issued by Lawrence Tomlinson, the "entrepreneur in residence" at the Business, Innovation and Skills Department. Among other things the report alleges that RBS has been forcing viable businesses with short-term cash flow problems into its corporate restructuring arm with the aim of forcing foreclosure and then making a profit from selling off property assets. When a bank does close down a firm, there is usually a difference of opinion over long term viability, and so the process is bound to be unpleasant. But from an economy wide perspective, you would hope that a bank was reasonably efficient at protecting those firms with innovative potential, because these firms will not only end up repaying their loans, but will be the basis for a mutually profitable future partnership. But Hamish McRae argues that gradually this ‘duty of care’ that banks once had with their customers has been replaced by a desire to flog products. And as the PPI scandal illustrates, banks seem not to worry about whether their customers need these products, as long as the sale is made. In terms of SMEs, some of the major damage may have been done by interest rate swaps: often complex hedging products which buyers may have not understood, or may have been missold. RBS appears to be heavily exposed to compensation claims involving these products. This example nicely illustrates the problem that appears to be at the heart of banking today. Products like interest rate swaps could potentially be useful to small businesses, protecting them from risk. This is how the expansion of the banking sector was portrayed by the banks themselves - they were selling innovative products that benefited their customers, and therefore the economy as a whole. But if these products are mis-sold, either to those who did not need them or by false claims about what they do, it is just a case of successful rent seeking (using the term in its wider sense): obtaining money from bank customers and providing nothing useful in return. It is very easy to get carried away with indignation at all this. As scandal after scandal emerges involving the UK banking sector, the only thing that seems to keep pace is the growth in bankers’ salaries. Growth which the UK government is trying as hard as it can to protect. And in the case of RBS, last year this bank even failed to keep its most basic service of operating a payments system going! But this post is designed to pose a rather different question. Is it possible that this combination of rent seeking and incompetence by the UK’s foremost provider of loans to SMEs had impaired the ability of the bank to ensure that firms that were more efficient and productive survived? Did this bank, and perhaps other banks, become so engrossed in selling products to customers that it no longer allocated what loans it did make efficiently? Could this, alongside low levels of overall lending, be a factor behind the puzzle that recent UK productivity growth has been so low both historically and in relation to other countries? We will probably never get good aggregate data on this, but that does not mean it has not happened. When that pioneering economist David Hume wrote about the problem of induction, he talked about the possibility that the sun would not rise one morning. There is no way we can know ‘for sure’ that it will rise. (In contrast, we know for sure that 1+1=2.) Just because the theories we have suggest it will rise each morning, and those theories have been right so far, does nothing to ensure they will continue to be right. The problem with this example is that it is very difficult to imagine the sun not rising every morning. Bertrand Russell had perhaps a better example. The chicken that is fed by the farmer each morning may well have a theory that it will always be fed each morning - it becomes a ‘law’. And it works every day, until the day the chicken is instead slaughtered. When I used to lecture about economic methodology, I liked to say that this chicken was not an economist. Now you might say that no chicken is an economist, but suppose that chickens were as intelligent as the farmer who keeps them, so they could be an economist. Economics is at a disadvantage compared to the physical sciences because we cannot do so many types of experiments (although we are doing more and more), but we have another source of evidence: introspection. So if Bertrand Russell’s chicken had been an economist, they would not simply have observed that every morning the farmer brought them food, and therefore concluded that this must happen forever. Instead they would have asked a crucial additional question: why is the farmer doing this? What is in it for him? If I was the farmer, why would I do this? And of course trying to answer that question might have led them to the unfortunate truth. I thought of this when reading through the fascinating comments on my post on rational expectations, and posts others had written in response. You can see why the habit of introspection would make economists predisposed to assume rationality generally, and rational expectations in particular. (I think it also helps explain economists’ aversion to paternalism.) It only works to use your own thought processes as a guide to how people in general might behave, if you think other people are essentially like yourself. So if your own thoughts lead you to postulate some theory about how the economy behaves, then others similar to yourself might be able to do something like the same thing. But of course this line of reasoning could also be misleading. An economist who introspects does so with the help of the economic theory they already have, so their introspection is not representative. A psychologist or behavioural economist might come to very different conclusions from introspection - what biases do I bring to this problem, they may ask. Economists may also be fooled into thinking their introspection is representative, because they are surrounded by other economists. So this conjecture about introspection does little to show that assuming agents have rational expectations is right (or wrong), but it may be one reason why most economists find the concept of rational expectations so attractive. Below are opening remarks prepared for the Festival of Economics 2013: The State of Economic Recovery in the UK at Bristol yesterday. I thought the title of the session would put people off, but I was very wrong. I don’t currently have time to do this kind of thing very often (yes, it showed), but an otherwise highly articulate and informed panel together with a really interested audience and excellent organisation seemed to me to produce a very successful event. What I want to do is look at why we had a recession, and what has happened over the last five years, to see whether that has implications for the type of recovery that we are likely to see. We can think of there being three stages in recovering from a recession. The first is to get the economy growing again. The second stage is to get growth strong enough such that we begin to recover the ground lost during the recession. That means growing at 3% pa +, not 1% or 2%. We are not yet at stage 2. The third stage is to achieve that above average growth for long enough to regain most of the ground we lost in the recession. Recessions are never a good thing, but we hope they make us poorer for just a few years, maybe even a decade, but not permanently poorer. In the past UK recessions (early 1980s, 1990s) were created by governments to get inflation down. They put up interest rates, which brought inflation down quite quickly, so they could then reverse the process. We got reasonably quick recoveries that made up much of the ground lost in the recession. The last recession was different. This was a recession made by banks, not governments. Bank’s vastly over extended themselves, so they collapsed when a relatively modest amount of loans went bad. Forget all the stuff you hear that the recession was due to irresponsible government borrowing – it is just not true. I’ve studied the numbers, and unless you live in Greece it’s nonsense. The recession was created by banks, but it was made worse by austerity. In the UK the economy got to stage 1 in 2010, but this was lost when governments in the UK and Eurozone started raising taxes and cutting spending. The independent OBR, the watchdog set up by the current government, estimate UK output has been 1.5% lower each year since 2010 as a result of the austerity imposed by the UK government, and their estimates are definitely on the conservative side. 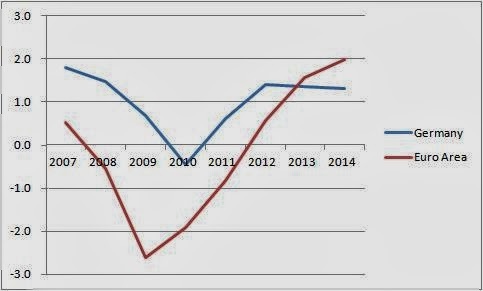 The European Commission calculate that EZ GDP in 2013 is 4.5% lower as a result of the austerity that started in 2011, and that has also had a big impact on the UK. This has implications for the recovery. Kick the economy down with austerity, and our standard economic models tell us it will – after a few years – bounce back. The more austerity, the bigger the bounce. The reason is that those sacked policemen or civil servants eventually get jobs elsewhere and start producing something else. So for that reason alone, once the recovery starts, it could be quite vigorous. Of course this does not mean that austerity was a good idea. Austerity has meant stage 1 has been delayed by 3 years. But in terms of stage 2, it could imply the recovery is stronger when it comes. But the really important question is stage 3 – making up the ground we lost. And here we need to look at another unusual feature of this recession in the UK: employment has held up much better than output. Now while that might sound good – and it is in the short term – it has a nasty implication. The difference between output and employment is labour productivity, so labour productivity growth has collapsed in this recession. Real wages tend to move with labour productivity, so this is an important reason why living standards have declined so much in the UK. No one really knows why productivity growth has slowed. That matters because if this slowdown in productivity growth is permanent, then the economy cannot make up much of the ground lost in the recession. We will not get stage 3, and we will all be permanently poorer. So answering the productivity puzzle is the key to knowing what kind of recovery we will have. My suspicion, shared by others at the Bank of England and elsewhere, is that some of the answer is to be found back where the recession began – with UK banks. Bank lending to firms is important in increasing productivity, because it allows the productive firms to expand (at home and overseas), and the new start ups to displace the older, less efficient firms. So when bank lending collapsed in the recession, productivity collapsed. If banks start lending again to these new and more productive (but also more risky) firms, we may be able to make up a good deal of that lost ground. So how are we with fixing the banks? The honest answer is I do not know, but let me end with a concern. Bankers like to pretend they make so much money because they do so much for the economy. There is very little evidence for that. Instead the evidence suggests they make money for two reasons. The first is what economists call rent seeking – essentially making money off other people. When it is illegal, we sometimes get to hear about it, but I suspect mis-selling is endemic. The second way banks make so much money is by taking risks. When collectively those risks go bad, governments step in to bail them out. They get the reward when the risk pays off, we pick up the tab when it does not. So in effect the public provides a huge subsidy to the banking sector, similar in size to the profits they make, and much of their profits go in bonuses. It would be much better for everyone else if the money paid in bonuses could instead be used to recapitalise banks, so they could start lending again to innovative firms. So it should be good news that the EU is intending to put a very modest cap on bankers’ bonuses. What is the UK government doing? It is taking the EU to court to try and stop this cap. So this is a recession created by banks, and there is a real danger that the power banks have over governments, and this government in particular, may mean we never make up the ground we have lost. Banking: general discussion of capitalisation, estimates of public subsidy, examples of mis-selling and illegal activity, Adair Turner on rent seeking (used, as Turner does, in a wider sense than just try to influence governments), potential influence of finance on conservative party, EU bonus cap saga. Larry Summers talk on secular stagnation has led to a burst of discussion on whether nominal interest rates may be at their Zero Lower Bound (ZLB) for longer than we might have thought. I would like to use this post to clarify a number of different ideas that may be involved here. Crucial to this discussion is the concept of the natural real interest rate (NRR). I will define this as the real interest rate that keeps inflation constant. (Sometimes economists define the NRR as the real interest rate that would occur if all prices were flexible, but I think that can be misleading when we are at the ZLB.) There are important issues about risk and different real rates that Tyler Cowen mentions which I will have to ignore. Crucial to Summer’s argument is that our problems did not all start with the recession. However it may be worth just noting some arguments that the ZLB may be around for some time that do begin with the recession. One way many economists think about the current recession is that it involves balance sheet adjustment: consumers and firms need to save to reduce their borrowing or increase their wealth. Ideally we would try and offset this by encouraging them to make this adjustment more slowly, or encouraging others to offset this, through negative real interest rates. If adjusting balance sheets takes a decade rather than five years, this may mean that the NRR is negative for much of this period, so we will be stuck at the ZLB for some time to come. Tightening fiscal policy lowers the NRR. One of the unusual features of this recession relative to earlier downturns is fiscal austerity, and this will reduce the NRR. There has been a lot of discussion about how recessions that result from a financial crisis may be longer lasting. In some countries there is a concern that banks are still carrying a large amount of bad loans, and that this may inhibit their lending for some time. Others worry that tighter regulation could have the same impact, although this is disputed. Just as a reduction in credit rationing can lead to a prolonged economic boom, an increase in rationing can have the opposite effect. There are also more complicated arguments involving a shortage of safe assets (like government debt) that can be used as collateral. All these stories generally start with the recession. However in the decade before the recession, the real interest rate associated with stable inflation appeared to be much lower than before: this is Bernanke’s savings glut. It seems clear that we have to take a global perspective on this, otherwise we end up chasing contradictory red herrings: worrying about the lack of investment in the US, and also worrying about overinvestment in China. The importance of thinking globally is emphasised in Daniel Alpert’s book, and by many others. One straightforward possibility is that the long run equilibrium NRR has fallen. In standard macroeconomic models, this rate is usually related to impatience, population growth, and technical progress. We know that population growth has shown substantial declines in the developed world, and will show similar declines in the developing world, so that world population may eventually stabilise in around 100 years. Some have also argued that the rate of technical progress has already, or is about to, decline. So there are good reasons for believing that the long run equilibrium NRR has fallen. It might be possible to construct demographic arguments for the medium term NRR to be below the long run NRR, but I will leave that to those who know more about savings behaviour in China and its neighbours. Another, but rather different, popular argument relates to inequality. It is often put very simply: as the rich have a lower propensity to consume out of income, shifts in the distribution of income towards the rich will tend to reduce aggregate consumption. For a more sophisticated discussion, see Interfluidity. Often solutions to problems depend on a good diagnosis of why these problems have arisen, but I can think of two solutions that appear to be robust to any of the stories outlined above. The first, discussed by Ryan Avent and made fairly explicitly in recent remarks by Blanchard, is to raise the inflation rate. The second, which a great many economists would sign up to even if they swear they are not Keynesian, is a sustained increase in public investment. The advantage of the latter over the former is that the former has clear costs, whereas the latter could have clear benefits. Of course we may need to do both. Of course I see it rather differently. Austerity is either a major technical error, or a political con. According to very conservative estimates from the OBR, it has already cost around 5% of UK GDP. That is a huge amount of money to waste: resources that wanted to be used to produce goods and income that everyone could enjoy, but which have been kept idle as a result of government action. Of course this cost has not been spread evenly, and has been much greater for some. If this was just my personal view, or the view of a cranky minority, then there is not much more to be said. But instead it is the view you will find in the economic textbooks, and I suspect among the majority of macroeconomists. So given this, the fact that the policy has been accepted with little protest is not something to be commended (unless you are in the business of manipulating opinion), but a major problem. It is a huge failure for good government, and our democratic system. In fact you see similar failings elsewhere. Austerity as a policy has not been seriously challenged in Europe among mainstream parties, and even in the US I think it would be fair to say that views both within the Democratic Party and from the President have been mixed. So how can Ganesh have completely the opposite view: that the British have shown “impressive calm” in taking their medicine with little protest, and that the lack of any passionate public debate about austerity in the UK is somehow a virtue? I can think of three reasons, none of which is very flattering. 1) That the “elite dialogue” that did take place on austerity is just so much intellectual hand wringing, and that the public know better what the real score is. I might not be surprised if a government politician took that line, but you would expect that a journalist working at the FT, and previously at the Economist, would know better. 2) That his admiration for George Osborne has distorted his view of the real world. Or, to put it slightly more kindly, if you spend your time talking to people who think austerity is inevitable, you begin to believe the propaganda. 3) That he is trying to analyse how the Conservatives have got away with the con of achieving a smaller state by fueling a panic over debt, without of course admitting that that is what he is doing. Yet whichever of these is the case, the article seems to miss two obvious points. Could it be that the reason there is not a passionate public debate in the UK about austerity is that there is no one to lead that debate? When the political class, of which he is a member, view austerity as inevitable, is it any wonder that the public takes a similar view (particularly when it is dressed up in terms of household economics). He acknowledges that the trade union movement has been vocal about austerity, but does not examine why this voice is largely ignored by the UK media. But none of that was what made me so cross reading the article. Instead it was its juxtaposition with something that I heard about 4 days ago. A reader of my blog, a retired teacher of A level economics and a LibDem member, is about to give a talk on austerity related themes. The features writer on a local newspaper was interested, and spent an hour interviewing him, later writing 750 words. The article was spiked by the editor, because it was controversial and critical of the government. Perhaps the editor was also showing the “impressive calm” which so pleases Mr. Ganesh. Should fears of financial instability raise interest rates? Inflation is significantly below 2% almost everywhere. In the US, Japan and the UK (even though in the UK inflation is still just above 2%) central banks are doing a great deal to get inflation back to 2%. Maybe not enough, but their goal is clear. The ECB is belatedly following the same path (although it remains somewhat behind), but this has caused a very public split in its ranks. One reason given by those who have opposed the ECB’s latest rate cut is a risk to financial stability, and house price increases in certain Eurozone cities. In the US some have raised concerns that continuing QE might generate financial instability. In the UK one of the three ‘knockouts’ to forward guidance, that could allow interest rates to rise even if unemployment remained above 7%, concerns financial stability. And in one country, Sweden, the independent central bank has kept interest rates above the ZLB, even though prices have been literally falling. 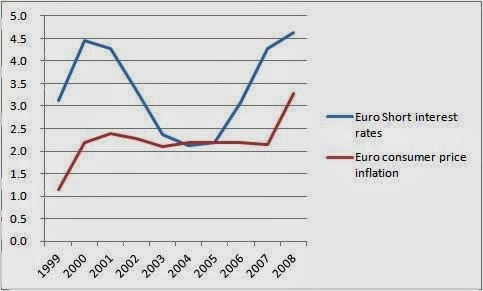 While the central bank cut short rates to 0.25 in 2009, during 2010 they were increased to 1%, and during 2011 to 2%. They have since been cut to 1%, but the central bank does not want to cut any further despite prices being flat or falling throughout 2013. Yet the central bank has a clear target for inflation of 2%. The reason the Swedish central bank - the Riksbank - is overriding its inflation target were clearly set out in a speech given by Kerstin af Jochnick, First Deputy Governor of the Sveriges Riksbank, in January 2013. The Riksbank is concerned that low interest rates will exacerbate a housing bubble. The discussion is interesting for at least two reasons. The first is that the Riksbank is not primarily concerned about the impact of any bursting bubble on the financial sector itself. It is not worried about a second financial crisis. Instead it is worried about the impact a bursting bubble might have on households (creating another balance sheet recession) and overseas confidence. The second is that the Governor is explicit that higher interest rates are a second best solution to this problem. The first best solution is macroprudential regulation. But, to quote the speech: “One reason why monetary policy in Sweden has needed to give consideration to financial imbalances is because there has been no framework for macroprudential policy.” The speech discusses the progress that the central bank has made in developing a framework for macroprudential regulation. In passing I would want to add that interest rate policy is probably the third best solution to housing market concerns. The potential for using particular fiscal policy instruments is often overlooked. For example, just as the UK government has tried (somewhat opportunistically) to stimulate the housing market through fiscal means (Help to Buy), these means can also be used to dampen that market. Indeed Goodhart and Baker have argued that Help to Buy can be seen as a macroprudential instrument. My more substantive point is that a monetary policy of the Swedish kind risks undermining the legitimacy of independent central banks. As regular readers will know, I believe strongly that there are areas of macroeconomics where delegation can be highly beneficial. You only need to look at the influence that misguided, and sometimes crazy, macroeconomic ideas can sometimes have among politicians to see why. On the other hand, delegation potentially undermines the democratic process. There is nothing which says that central bankers, or experts who sit on monetary policy committees, have any particular right to take decisions which can have a substantial impact on people’s lives. That is one reason why Alesina and Tabellini , among others, stress that successful delegation happens when there is a broad consensus on what constitutes sound policy. I think one reason that delegation of monetary policy to central banks has been largely uncontested so far is that this consensus existed for monetary policy. Essentially the task of central banks was to keep inflation low. Of course there is plenty of scope to discuss the details of how this is done, which macroeconomists spend a great of time doing. But the primary task, and the proximate means by which it should be achieved, were clear and commanded near universal support. For some time the only potentially competing goal was keeping unemployment low: hence the dual mandate in the US. However there was near universal agreement amongst economists that the only sustainable level of unemployment or output that monetary policy should try to achieve was precisely the level that kept inflation stable. If that level of unemployment was too high, then means other than monetary policy should be used to address that problem. Again there are disputes at the margins, particularly when supply or cost-push shocks hit, but little dispute about the basic idea. The moment central banks start allowing inflation to be persistently below target (with the loss in output that this implies) because of concerns about housing bubbles, this consensus will evaporate. Again Sweden provides a clear example. Lars Svensson, a highly respected academic and a former Deputy Governor of the central bank, has strongly disputed that this policy will achieve the goals it is designed to achieve, and instead suggests that the central bank is violating its mandate. (A good summary is here.) On the more general issue of how much monetary policy should take account of financial risk or housing bubbles there is a wide spectrum of views among economists. It is also not difficult to see how reasoned debate could easily escalate into attacks on central bank independence itself. If the central bank begins to be perceived as protecting the interests of the financial sector rather than the public at large, then demands for the government to take back the control of interest rate setting could become difficult to resist (even if the government wanted to resist). I would have no difficulty writing the slogan myself. First the banks created the recession, and now (through the central bank) they want to take away the recovery. One response to this argument might be that the public would not forgive a central bank that allowed a second financial crisis to develop. I would agree that in the absence of any other remedy interest rate policy should be influenced by the possibility of a financial crisis, as Michael Woodford has demonstrated formally (see this post). So how do you exercise this option of last resort, but still ensure the legitimacy of independent central banks by focusing on the control of inflation? I quite like the arrangement in the UK, where there is a separate Financial Policy Committee (FPC) that works with but is independent of the Monetary Policy Committee (MPC). The FPC, not the MPC, is in charge of macroprudential policy. The knockout to forward guidance that I mentioned above involving financial instability is called by the FPC, and the MPC can then decide whether to act on that call. Such an arrangement works best if both committees are populated by experts from outside the central bank, and in the case of the FPC those experts are not just current or past bankers. It has the advantage that before the MPC can even begin to consider allowing fears of financial instability to influence its interest rate judgement, the FPC has to in effect say we have exhausted all the other means at our disposal. It would be also good if the FPC was explicit about any micro fiscal issues that might also be involved, just as Bernanke has been explicit about the problems macro fiscal policy has caused him in the last year or so. This institutional arrangement makes it clear that it is for others, and not those who set interest rates, to protect mortgage borrowers from their own potential folly. See this article by Hans-Werner Sinn for example. To be fair housing is only briefly mentioned there, and the main point seems to involve something else, although what exactly is less clear to me. Alesina, A. and Tabellini, G. (2007) “Bureaucrats or politicians? Part 1: A single policy task.” American Economic Review 97: 169–179. A recurring theme in economics blogs, particularly those that tend to be disparaging of mainstream Keynesian theory, is that Keynesians like to be New Keynesian (NK) when talking about theory, but Old Keynesian (OK) when talking about policy. John Cochrane has recently made a similar observation, which is picked up by Megan McArdle. To take just one example of this alleged sin, in the basic New Keynesian theory Ricardian Equivalence holds (see below), so a tax financed stimulus should be as effective as a debt financed stimulus, yet Keynesians always seem to prefer debt financed stimulus. The difference between Old and New that Cochrane focuses on relates to models of consumption. In the first year textbook OK model, consumption just depends on current income. The coefficient on current income is something like 0.7, which gives rise to a significant multiplier: give these consumers more to spend, and the additional spending will itself generate more output, which leads to yet more income, and so the impact of any stimulus gets multiplied up. Basic NK models employ the construct of the (possibly infinitely lived) intertemporal consumer. To explain, these consumers look at the present value of their expected lifetime income, and the income of their descendents if they care about them (hence infinitely lived). This has two implications. First, temporary shocks to current income will have very little impact on NK consumption (it is a drop in the ocean of lifetime income). The marginal propensity to consume out of that temporary income (mpc) is near zero, so no multiplier on that account. Second, a tax cut today means tax increases tomorrow, leaving the present value of lifetime post-tax income unchanged, so NK consumers just save a tax cut (Ricardian Equivalence), whereas OK consumers spend most of it. However NK consumers are sensitive to the real interest rate, so if higher output today leads to higher inflation but the nominal interest rate remains unchanged, then you get a multiplier of sorts because NK consumers react to lower real interest rates by spending more. So if mainstream Keynesian theory wants a more realistic model of consumption, it often uses the (admittedly crude) device of assuming the economy contains two types of consumer: the unconstrained intertemporal type and the credit constrained type. A credit constrained consumer that receives additional income could consume all of that additional income, so their mpc out of current income is one. That credit constrained consumer is therefore rather Old Keynesian in character. But there are also plenty of unconstrained consumers around (e.g. savers) who are able to behave like intertemporal maximisers, so by including both types of consumer in one model you get a hybrid OK/NK economy. So it is perfectly possible to be an Old Keynesian and a New Keynesian at the same time, using this hybrid model. It may not be a particularly elegant model, and the microfoundations can be a bit rough, but plenty of papers have been published along these lines. It is a lot more realistic than either the simple NK or OK alternatives. It explains why you might favour a bond financed stimulus over the tax financed alternative, because there are plenty of credit constrained consumers around who are the opposite of Ricardian. You can make the same point about one of the other key differences between OK and NK: the Phillips curve. The New Keynesian Phillips curve relates inflation to expected inflation next period, and assumes rational expectations, while a more traditional Phillips curve combined with adaptive expectations relates current inflation to past inflation. While I do not think you will find many economists using the OK Phillips curve on its own nowadays, you will find many (including this lot) using a hybrid that combines the two. The theoretical reasons for doing so are not that clear, but there is plenty of evidence that seems to support this hybrid structure. So once again it makes sense to be both OK and NK when giving policy advice. Neither story is as exciting as the idea that New Keynesians are really closet Old Keynesians, who only pay lip service to New Keynesian theory to gain academic respectability. Instead it’s a story of how mainstream Keynesian economists try to adapt their models to be more consistent with the real world. How dull, boring and inelegant is that! I say ‘could’ here, because if the increase in income lasts for less time than the expected credit constraint, then smoothing still applies, and the mpc will be less than one. My own view is that the mpc out of temporary income is also significant because of precautionary savings: see the paper by Carroll described here. In my last post I wrote: “Mapping macroeconomics into a morality play is almost always a mistake.” I can think of lots of examples. For example: The private sector has to tighten its belt, so the public sector should too. Or: Recessions are a punishment for previous excess. Within a currency union, when the central bank is willing and able to do its job, these morality stories are often about what happens when one part of the union deviates from the inflation target. (Any deviation of inflation from target is accompanied by unwarranted movements in output: I’ll take these as read in what follows.) Let’s imagine dividing the Eurozone in half, and call each half G and R. So the standard story is that ‘excess’ in R raises inflation in R: to 3% say. The ECB does its job, keeping average inflation at 2%, which means inflation is forced down to 1% in G. This makes G too competitive, so if the ECB was willing or able to keep average inflation at 2% we would have to have a period of 3% inflation in G and 1% in R to put things right. The morality often drawn here is straightforward: irresponsible excess in R has led to uncomfortable deviations from the ideal of 2% inflation in G. The morality play normally skates over the fact that this excess in at least parts of R was financed by lending from G: morality always seems to reside with the borrower. But we could tell the story a different way. The problem started because G tried to undercut prices in R, by allowing inflation in G to be 1%. As the ECB had to keep average inflation at 2%, this 'forced' inflation in R to 3%. G is now enjoying the benefits of undercutting R, and is very reluctant to undo the process. This is about how real exchange rates are determined in the medium term. So we abstract from the complications caused by sticky prices and monetary policy. However as anyone who understands uncovered interest parity knows, exchange rates in the short run depend crucially on expectations about medium term exchange rates, so the determination of medium term exchange rates is important whatever your time horizon. The framework I use when teaching at masters level is the ‘new open economy’ (NOEM) approach, associated with Obstfeld and Rogoff in particular. A classic survey is by Philip Lane. If this framework could be summed up in one sentence, it would be this. In a world where most international trade takes place in goods sold in imperfectly competitive markets, the real exchange rate moves to equate the demand and supply for domestically produced output. What follows is not about whether that framework is empirically useful, but why teaching it can avoid some confusions and pitfalls. This concept was not of course invented by NOEM. John Williamson’s approach to determining equilibrium exchange rates, later taken up by the IMF and others, is based on the same idea. (See this earlier post for references. Williamson's work can in turn be seen as a development of the 'Swan diagram'.) Indeed I sometimes get annoyed that the NOEM literature typically ignores its antecedents. However one source for confusion is that the essentially empirical literature associated with Williamson focuses on the current account, rather than the supply and demand for domestic output. It does this because the current account is a readily available indicator of this supply and demand balance much of the time. But not always, as the following classic example shows. Suppose an economy discovers a finite natural resource, like oil, which takes a negligible amount of labour to extract. It takes a few years before the discovery leads to the resource being extracted, but the extent of the resource is common knowledge. This is a standard exercise in consumption smoothing. Consumption rises the moment the resource is discovered, anticipating higher future income. This leads to a current account deficit until the resource is extracted. Once it starts being extracted, consumers are now consuming less than their income, first to pay off their borrowing, and then to save for the day the resource runs out. So while the resource is extracted we get a current account surplus. What happens to the real exchange rate? If we focus on the current account, we might be tempted to say that it first depreciates, and then appreciates when we have a surplus. This would be wrong. We could start with a special and highly unrealistic case, where there are no non-traded goods, the economy is so small that only a negligible amount of the additional consumption is spent on home produced goods, and labour supply is fixed. In that case nothing would happen to the real exchange rate at any time. More realistically, transport costs will mean there is some ‘home bias’ in consumption, and also some of the consumption will go on domestically produced non-traded goods. Both imply a domestic real appreciation, which begins while the current account is in deficit, and which stays the same as the current account switches to surplus. In addition, if consumers want to match higher consumption with more leisure, labour supply will decrease, and we get an appreciation to choke off demand for domestically produced goods. Again this happens throughout, and not just when the resource is extracted. The reason why looking at the current account is misleading is that we are ignoring the capital account. Before the resource is extracted, consumption rises through borrowing from abroad. If all the extra consumption is on overseas goods, those lending to consumers require no domestic currency (they can lend in dollars). But if some of the additional consumption is spent domestically, some of the lending must also be in domestic currency, so we get an appreciation. Once the resource begins to be sold (for dollars), it is as if all the extra income is used to buy overseas assets. So the size of the appreciation remains unchanged. Thinking about both current and capital accounts in this situation is tricky, but thinking about the supply and demand for the domestically produced tradable goods gives us the same answer much more easily. In a simple model without capital, supply is just labour supply and productivity. For a small open economy where there are no non-traded goods or home bias, demand for domestically produced goods just depends on world output and competitiveness=real exchange rate. In this simple set-up a consumer price based real exchange rate is constant (PPP holds), but once we introduce realistic features like home bias or non-traded goods competitiveness influences a consumer price based real exchange rate, and PPP no longer holds. For simplicity ignore the capital required to extract the resource, and we assume all the income from the resource goes to domestic consumers. The two mechanisms work in different ways, however. The additional demand for non-traded goods takes labour away from traded goods production, so reduced traded goods supply leads to an appreciation. With home bias we get an appreciation because of the additional demand for domestically produced traded goods.